Investors fled riskier assets like stocks and loaded up on traditional safe havens like bonds and gold. 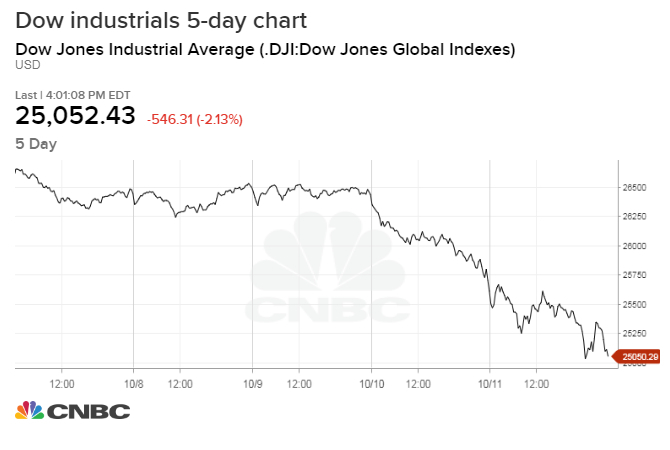 The Dow fell as much as 698.97 points at its lows of the day, after dropping 831 points on Wednesday. "It's a momentum correction, not a portfolio correction," says Joe Terranova, chief market strategist at Virtus Investment Partners. "While we have a bias to believe 2008 could happen again, I don't think this is the case." Stocks fell sharply on Thursday in a second straight scary day on Wall Street as investors dumped equities around the globe because of fears of rapidly rising interest rates, a possible global economic slowdown and overly ambitious tech valuations. The Dow Jones Industrial Average closed 545.91 points lower at 25,052.83, bringing its two-day losses to more than 1,300 points. The S&P 500 dropped 2.1 percent to 2,728.37 and posted its sixth straight decline. The broad index also closed below its 200-day moving average for the first time since April. The Nasdaq Composite pulled back 1.3 percent to 7,329.06 and briefly entered correction territory at its lows on Thursday. The Dow fell as much as 698.97 points at its lows of the day. The indexes bounced after a report said President Donald Trump and Chinese President Xi Jinping would meet at next month's G-20 summit, briefly giving traders hope a full-blown trade war with the country could be avoided. October, a month known for major market sell-offs in the past, has been a brutal month for investors so far. The S&P 500 has lost 6 percent during the month so far and is now higher by just 2 percent for 2018. Treasury yields pulled back from multiyear highs, with the benchmark 10-year yield sliding to 3.13 percent. The two-year yield also fell to 2.84 percent. The iShares 20+ Year Treasury Bond ETF (TLT) jumped 1.2 percent as investors clamored into bonds for safety. Tech shares fell more than 4.5 percent on Wednesday, marking their worst day since 2011. The sell-off led to the Dow sinking more than 800 points and the S&P 500 dropping more than 3 percent.